Last week, Investors Intelligence reported the most lopsided bullish extreme in over 30 years, with 64.4% of investment advisors bullish and just 13.5% bearish. Likewise, the Daily Sentiment Index for both S&P 500 and Nasdaq futures reached the most extreme levels in their history. Regardless of the condition of market internals, and even during the half-cycle since 2009, the S&P 500 has lost value, on average, when we’ve observed the combination of: 1) a bull/bear ratio of even 2-to-1, currently more than 4.7-to-1; 2) rich valuations – anything above a Shiller P/E of 18, though even the current level of 30 understates the valuation extremes here, and; 3) overbought conditions – for simplicity, let’s say an S&P 500 Index anywhere more than 7.5% above its 200-day average. Despite the far more extreme combination of conditions at present, our immediate market outlook remains neutral, not negative, though I continue to believe that it’s reasonable to pair a flat position with a small “tail risk” hedge several percent below current levels. Our reasons for this investment outlook aren’t new. Since we adhere to a very specific discipline, our discussion of the reasons behind any particular investment stance necessarily involves a review of the key considerations of our discipline. Presently, I can’t think of a more important discussion, because I expect these key distinctions to matter enormously to investors over the completion of this cycle. In prior market cycles across history, the emergence of various syndromes of “overvalued, overbought, overbullish” conditions reliably warned that speculation had essentially run its course. Those syndromes helped to anticipate steep market losses even before market internals had deteriorated explicitly. Indeed, on much broader criteria, the syndromes we currently observe are identical to the ones that marked the 1973, 1987, 2000 and 2007 market peaks. Because of that historical reliability, the methods that emerged from our 2009-2010 stress-testing exercise raised the priority of these “overvalued, overbought, overbullish” syndromes. After admirably navigating multiple complete market cycles, including two of the steepest bubbles and collapses since the Great Depression, history convinced me that certain syndromes of market conditions were sufficiently extreme and offensive that they created a barrier to further speculation. Unfortunately, zero interest rate policy and post-election enthusiasm disrupted that history, and encouraged relentless speculation in recent years despite the repeated emergence of these syndromes. In hindsight, the stupidest thing I ever did as a professional investor was to imagine that there was some limit to the stupidity of Wall Street. That comment may not seem terribly humble, but as a dear friend and mentor once told me “There’s a difference between humility and false humility.” Sometimes you have to speak your truth if you believe it will be helpful to someone, even if others don’t want to hear it. I’ve got no antidote for those who believe that the dot-com bubble, the housing bubble, or the current “everything bubble” are more than a salad of reckless speculation, herd mentality, and fear of missing out. Having anticipated the collapse of the other two bubbles, and correctly projecting the extent of those losses, it’s clear that my error in this bubble was to underestimate the tenacity of blind speculation (and fail to take advantage of it). The error wasn’t overlooking some kind of justified or durable legitimacy to this madness. As I wrote at the March 2000 bubble peak, just before the S&P 500 dropped by half, and the Nasdaq lost four-fifths of its value, “On Wall Street, urgent stupidity has one terminal symptom, and it is the belief that money is free.” Here we are again. Fortunately, it’s possible to distinguish between a market that’s prone to speculation and one that’s prone to risk-aversion. When investors are inclined to speculate, they tend to be indiscriminate about it. For that reason, the best measure of that psychological preference toward speculation or risk-aversion is what I often call the “uniformity” of market internals – a signal that we draw from the joint behavior of thousands of securities of varying risk. Though we observed some early dispersion in these measures late last year (the most notable divergences currently being in interest-sensitive securities), we’ve limited ourselves to a neutral – not bearish – investment outlook here, until we observe broader deterioration in those measures of market internals. It’s worth emphasizing this point. In recent years, we’ve adapted our discipline to fully restore the priority of market internals above “overvalued, overbought, overbullish” syndromes. In the face of overextended extremes, we can take a flat, neutral outlook, but we do not adopt a strongly bearish outlook unless market internals have deteriorated explicitly. In 2014, we made that adaptation, but applied it only to zero interest rate conditions. Last year, we prioritized market internals above those syndromes with no exceptions. The fact that we introduced that adaptation incrementally in recent years may make it seem as if there has been no adaptation to our discipline at all, but that’s an illusion. I expect that time will show that soon enough, and patience will prove valuable. Our present methods are actually inclined to encourage aggressive or constructive market exposure in more than 70% of periods across history, and would have done so only slightly less frequently during the recent half-cycle since 2009. “Aggressive” here means a fully unhedged position, possibly using call options to provide modest leverage. “Constructive” means a stance that expects to benefit from market advances, but also carries a safety net in one form or another. If you understand the adaptations we’ve made in recent years, these investment stances will not come as a surprise when we adopt them. Still, don’t underestimate the profound damage that can be done to the market during that remaining 30% of market conditions. I remain adamant that it is not necessary for investors to expose themselves to market risk in periods of rich valuations and deteriorating market internals, particularly coming off of overvalued, overbought, overbullish extremes. 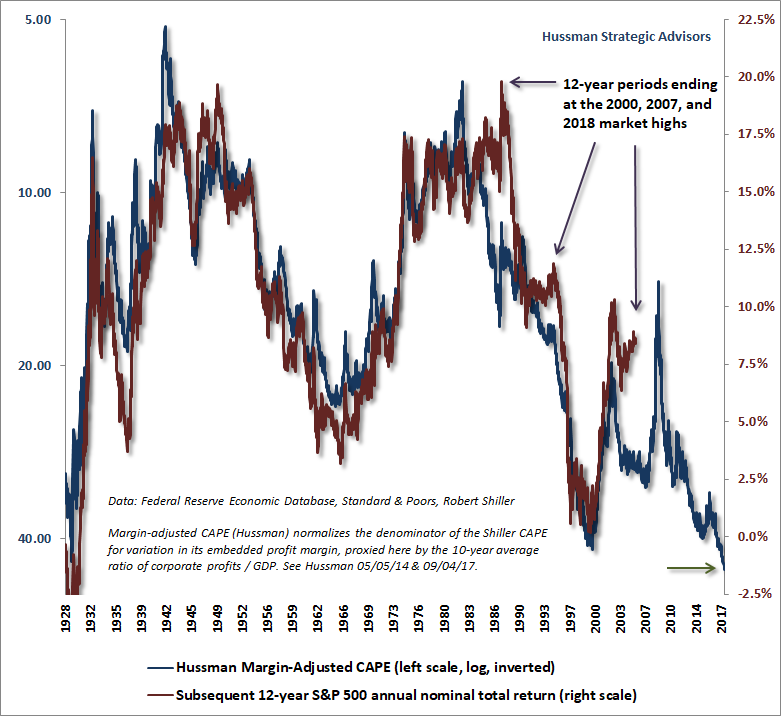 Extraordinary market losses can emerge during those periods, and I fully expect the collapse of this speculative half-cycle to follow that historical script. The most historically reliable valuation measures we identify now stand more than 2.9 times the level we expect them to revisit over the completion of the current market cycle. Yes, that implies a seemingly preposterous loss of over -65% in the S&P 500, most likely over the coming 2-3 years. Then again, my March 2000 projection that technology stocks stood to lose -83% seemed equally preposterous, but that turned out to be the actual loss in the tech-heavy Nasdaq 100 between that point and October 2002. Over the past 5 years, the revenues of S&P 500 technology companies have grown at a compound annual rate of 12%, while the corresponding stock prices have soared by 56% annually. Over time, price/revenue ratios come back in line. Currently, that would require an 83% plunge in tech stocks (recall the 1969-70 tech massacre). The plunge may be muted to about 65% given several years of revenue growth. If you understand values and market history, you know we’re not joking. Valuations matter enormously for long-term market outcomes (on the order of 10-12 years), and for the projection of potential market losses over the completion of any given cycle. The only complication is that valuations are almost entirely useless in gauging market prospects over shorter segments of the cycle when investors have a speculative bit in their teeth. The following charts will provide an indication of where the most reliable valuation measures we identify stand at present. The first is our preferred measure, which I introduced in 2015. 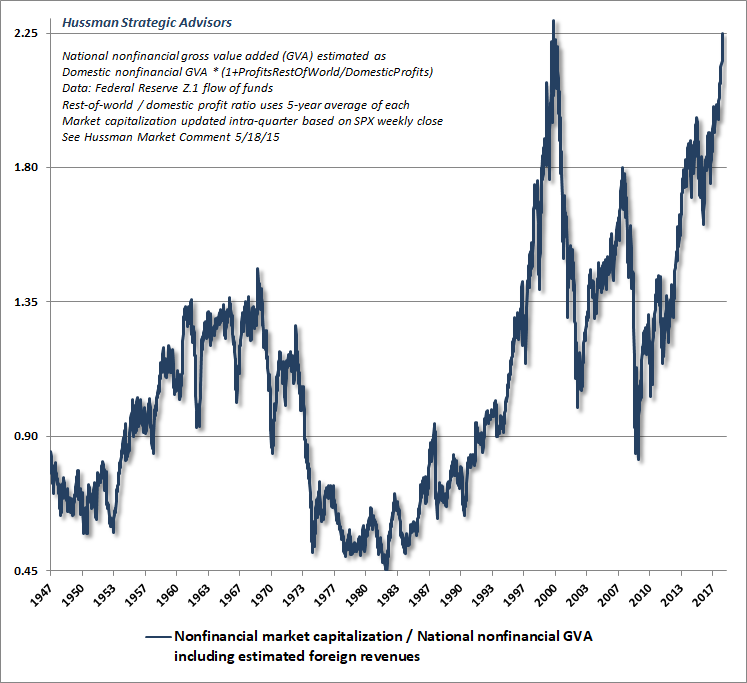 MarketCap/GVA is the ratio of nonfinancial market capitalization to corporate gross value-added, including estimated foreign revenues. This measure now stands just shy of the 2000 extreme. The correlation between (log) MarketCap/GVA and actual subsequent 10-12 year market returns is -0.92, a stronger correlation than any other valuation measure we’ve examined across history. The blue line below shows MarketCap/GVA on an inverted log scale (left). The red line shows actual subsequent 12-year S&P 500 annual total returns (right). Presently, the current extreme implies negative expected S&P 500 total returns over the coming 12-year period. The next measure is my Margin-Adjusted CAPE, which improves the correlation of the Shiller cyclically-adjusted P/E with subsequent returns by accounting for variation in the embedded profit margin. This measure is now beyond both the 1929 and 2000 extremes, placing current market valuations at the richest level in U.S. history. To understand why such valuations aren’t “justified” by low interest rates, reduced taxes, or other factors, see Why Market Valuations Are Not Justified By Low Interest Rates, Survival Tactics for a Hypervalued Market, and other data and analysis I’ve presented in recent months. 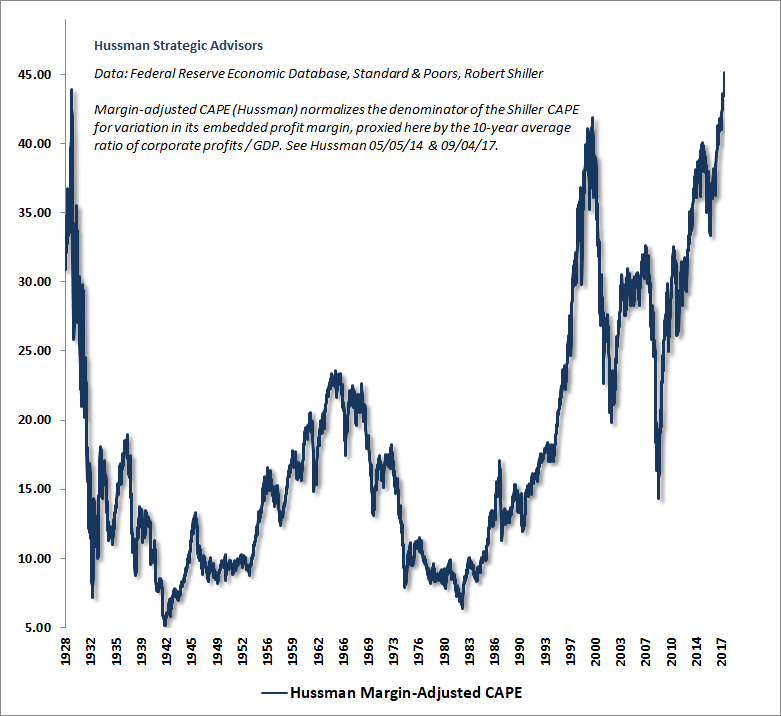 One of the benefits of the Margin-Adjusted CAPE is its relatively long history. The chart below shows the relationship between this measure of valuation and actual subsequent 12-year S&P 500 total returns. 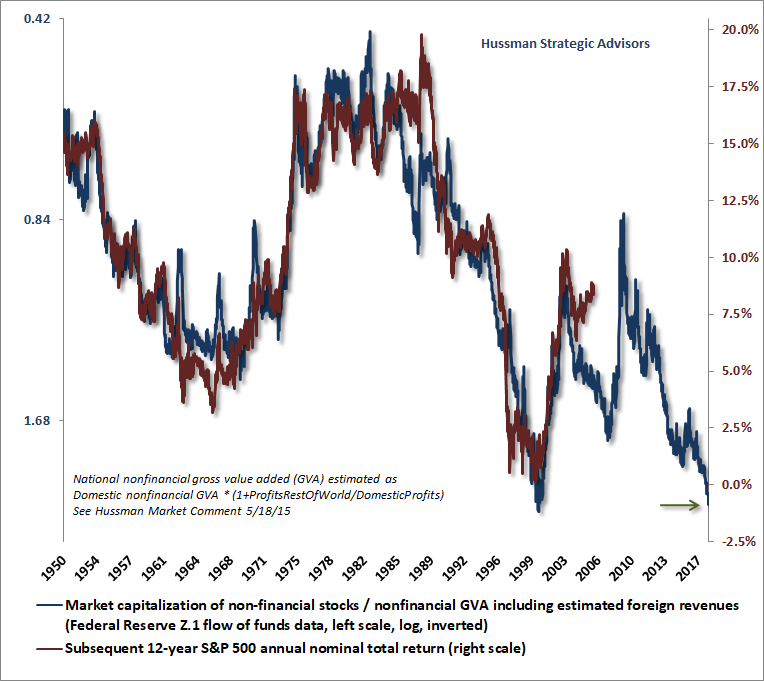 Notice that “errors” in the model are invariably the result of extreme valuations at the end of a given 12-year period. Indeed, as I observed in my January 2018 comment, these deviations are tightly correlated to cyclical extremes in consumer confidence, which typically wash out over the completion of the market cycle. It’s essential to distinguish between valuations, which have long-term implications, and the “uniformity” of market internals, which has implications for shorter segments of the market cycle. In both 2000 and 2007, extreme valuations encouraged my seemingly preposterous suggestions that the S&P 500 stood to lose nearly half its value over the completion of those cycles. It was not durable economic fundamentals or “justified” valuation that drove the market to those extremes. It was speculation. Once market internals deteriorated, we correctly drew the signal that those extremes were vulnerable to collapse. Notably, even since 2009, the market has lost value, on average, in periods where overvalued, overbought, overbullish conditions were joined by unfavorable market internals. As long as market internals are prioritized, that combination of factors has remained as effective as ever. So here we are, nearly three times the level at which I expect the S&P 500 to complete this cycle. Yet even though I expect the market to lose nearly two-thirds of its value over the completion of this cycle, our immediate outlook remains neutral. If we observe a retreat in the most extreme overbought features of the market, and provided relatively low option market volatility and fairly intact market internals, we could even be inclined – if only for a modest period of time – toward a net investment stance that more resembles a call option than a flat position. In any event, I believe that inexpensive tail-risk hedges should be set several percent below current levels, which is where our measures of market internals would most likely shift to a hard-negative condition. We would not rely on “stop loss” orders, however, as the ability to actually execute is likely to become a problem once the market turns lower. To be clear, we’ve adopted a flat, neutral outlook at present. Still, if overbought conditions were to ease by a few percent without a clear deterioration in market internals, we wouldn’t object to a constructive investment outlook, provided a safety net and ideally something that might benefit in the event that severe tail risks unfold. We would not, however, even dream of carrying an unhedged investment stance, which is unfortunately the position that most investors, retirees, and pension funds have adopted. 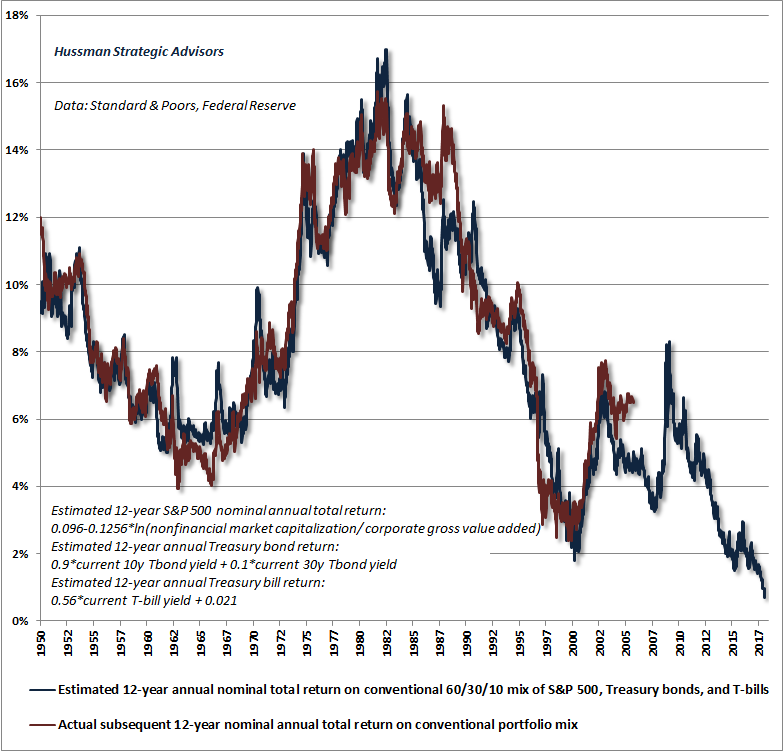 The chart below shows our best estimate of prospective 12-year total returns for a conventional portfolio invested 60% in the S&P 500, 30% in Treasury bonds, and 10% in Treasury bills. At present, valuations in both the stock and bond markets are sufficiently extreme to drive the overall estimated return to less than 1% annually. These are the worst estimated investment prospects for passive investors in history, and I expect they will create enormous difficulties for pension funds as they unfold. When someone says “stocks are reasonably priced relative to bonds,” what they really mean (perhaps inadvertently) is that both are priced at steep valuations that imply similarly dismal long-term returns. Still, these prospects will likely change over the completion of the current market cycle. Of course, we fully expect that investors who passively lock in current valuations and return prospects will experience overall portfolio losses between now and then. Keep three things in mind: 1) valuations, which drive the long-term and full-cycle outlook; 2) market internals, which capture shorter-horizon speculative pressures, and 3) extreme overvalued, overbought, overbullish conditions, which are capable of holding us to a neutral outlook, but not an outright negative one until market internals deteriorate explicitly. My comments from the 2000 and 2007 market peaks (just prior to market collapses of -50% and -55%, respectively) will illustrate the discipline I’ve advocated here. The key thing to remember is that valuations appear to be irrelevant when investors are inclined toward speculation, and then matter with a vengeance when that psychological disposition gives way to risk-aversion. Avoid the temptation of believing that just because prices have reached a certain level, they must actually belong there. Instead, use valuations to envision the “big picture” – expectations for long-term investment prospects, and potential risks over the completion of the cycle. Understanding valuations helps to identify when safety nets and tail-risk hedges are appropriate (as they are now). Still, recognize that outcomes over shorter segments of the market cycle are driven primarily by investor psychology, which we infer from market internals. At the point that investor preferences shift toward risk-aversion, much of this imaginary “paper wealth” will be consumed by a large ball of flames, and investors who imagined that current valuations were somehow “justified” will re-learn the same lesson that other speculative cycles should have taught. One of the best indications of the speculative willingness of investors is the ‘uniformity’ of positive market action across a broad range of internals. Probably the most important aspect of last week’s decline was the decisive negative shift in these measures. Since early October of last year, I have at least generally been able to say in these weekly comments that “market action is favorable on the basis of price trends and other market internals.” Now, it also happens that once the market reaches overvalued, overbought and overbullish conditions, stocks have historically lagged Treasury bills, on average, even when those internals have been positive (a fact which kept us hedged). Still, the favorable market internals did tell us that investors were still willing to speculate, however abruptly that willingness might end. Evidently, it just ended, and the reversal is broad-based. Dr. King noted that he tried to speak on the subject below at least once a year. That still seems an appropriate way to honor him. If you’ve never read Dr. King’s writings, this talk is a good place to start. In a world so urgently in need of peace and civility, it’s equally urgent to recognize that answering hatred with hatred never leads to that goal. My friend and teacher Thich Nhat Hanh, who was nominated for the Nobel Peace Prize by Dr. King, has often said “There is no way to peace. Peace is the way.” The first peaceful step always begins with the recognition by each side that the person they would call their enemy also suffers. In our common humanity, each of us might be like the other if we had suffered the same way – whether that suffering takes the form of injustice, poverty, violence, abuse, or even ignorance. In a world where people – on both sides of the word “enemy” – seem so inclined to carelessly pour their reservoir of suffering onto others without recognizing their shared humanity, our best cause for hope still resides in the wisdom of peacemakers like Dr. King. One can’t read his words without coming away better for it.